Aortic stiffness is a measure of health not many people are familiar with, but should be. The stiffness of your aorta has been shown in many scientific articles to be a powerful indicator of internal health. Aortic stiffness is a bellwether (a warning sign) of what’s going on in your body’s core regions, where most of your vital internal organs are located. Aortic Stiffness is determined by measuring Aortic Pulse Wave Velocity (AoPWV), the speed with which pulse waves travel down the walls of the Aorta. When a pulse wave reaches the far end of the Aorta it reflects back towards the heart. In a young person the reflected wave arrives back at the heart just as the heart finishes its contraction phase and is entering the relaxation phase. The reflected wave induces flow of blood into the arteries that feed the heart muscle. If the aorta has stiffened with aging, pulse waves will travel down and reflect back up the Aorta with greater speed. In an older person with a stiffer Aorta the reflected wave arrives back at the heart much earlier, while the heart is still contracting. The reflected wave and the primary contraction wave crash into one another, leading to an increase in pressure. This is a common reason why people get high blood pressure. Early return of the reflected wave also results in the fragile blood vessels of the brain being exposed to higher peak pressures and decreased blood flow to the heart muscle during its relaxation phase. Increased stiffness of the Aorta is an indication of stiffness throughout the chest and abdominal cavities. Most of the vital organs sustaining human life reside in these cavities. Vital organs rely on physical movement for optimal circulation of fluids within each organ. This internal organ circulation allows each organ to function and to maintain health. With increased stiffness of the spine and great cavities, there is decreased overall movement and less internal organ circulation, leading to less than optimal organ function and a decline in overall health. Twenty years ago, using a homemade heart rate sensor made from an LED and a Photodiode, I caught my first glimpse of the arterial pulse wave. Surprisingly I saw that each person’s pulse wave was made up of three separate waves, a primary contraction wave, a reflected wave and a wave related to the heart entering its relaxation phase. 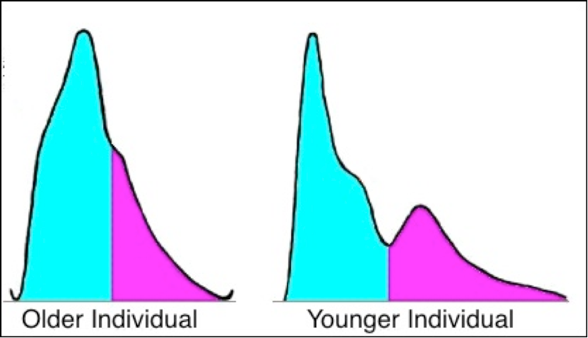 Looking at pulse signals from younger and older individuals, as shown below, I was able to see a great difference in the location of these three waves and changes in overall shape of the pulse as a result of changes in AoPWV. The way iHeart determines Aortic Stiffness is by performing an analysis of pulse shape and identifying the reflected wave. With exercise, good diet and stress management Aortic stiffness is reduced and pulse shape appears younger. iHeart makes it easy for people to objectively follow health as measured using Aortic Stiffness. Every person has great power to influence health in positive ways by making healthy lifestyle choices on a daily basis. By following aortic stiffness readings, people can measure their health in a whole new way, from the inside out.